Our go-to place to eat is a seafood restaurant right around the corner. Since we've been there so often we almost always order the special and almost always have the same drink. We've pretty much had everything on the menu so we've fallen into a nice routine. I decided, today, that instead of going to the restaurant for dinner we'd recreate a typical experience here at home and we'd by having linguine with clam sauce. I purchased everything I needed yesterday but I forgot to buy linguine and clams. Apparently I've never been shopping before so this morning I went out to buy the missing ingredients. 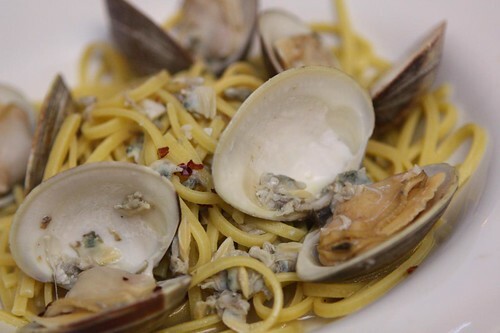 When I came home I found that I'd gotten clams but forgotten to buy linguine. How, you ask, could I forget to buy one item from a two item list? Well, I'm really very dumb. After going out, again, I was able to get some linguine and get to work. Not that it's much work to make linguine with clam sauce. Jen is always delighted to have pasta with clam sauce. Since my mom is Italian we used to have this about once a week growing up. It was one of my favorites. Jen thinks that is crazy because she never had this until she left home. It couldn't be easier to make. 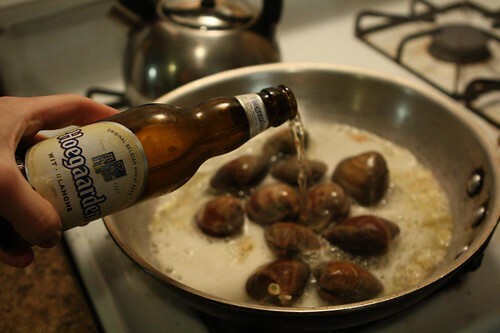 I made a slight variation to the traditional recipe by using beer (Hoegaarden) instead of white wine. I simply used garlic, butter, olive oil, clam juice, clams, red pepper flakes, and a little beer. I cooked it down then added the cooked linguine at the end. Well, I actually used ciriole instead of linguine because they didn't have any linguine at the store. That's right. You heard me correctly. They had ciriole (a pasta I'd previously not heard of) but not not linquine at the store. 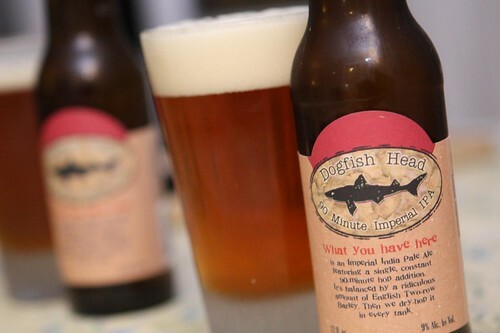 For beer we had the same beer we always have at the restaurant: Dogfish Head's 90 Minute IPA. We've had this beer a lot in the last few months. I've actually come to think of it as the natural accompaniment to any seafood dish. I only had the 60 Minute IPA recently but the 90 Minute is a very interesting beer indeed. Even as someone who's not all that crazy about IPAs I am a huge fan of the 90 Minute. Halfway through the meal Jen said, "This tastes better at the restaurant." I admitted that the clam sauce was not my finest but then she revealed that she was talking about the beer. I guess the charm of the restaurant must lend a lot to her enjoyment of the beer. Our living room is, admittedly, a little less charming. It is, however, approximately $50.00 cheaper. Saving $ is a good. It will cost you $60K a year to keep me in a nurisng home so I don't come live with you. That is what old boomers do! Perfect! We know a place that serves the best gruel in town!